A lot of people have had trouble learning not only how to trawl but also what the displays mean on the interactive screen. This guide is to help out by explaining the basics of trawling as well as what the displays mean. 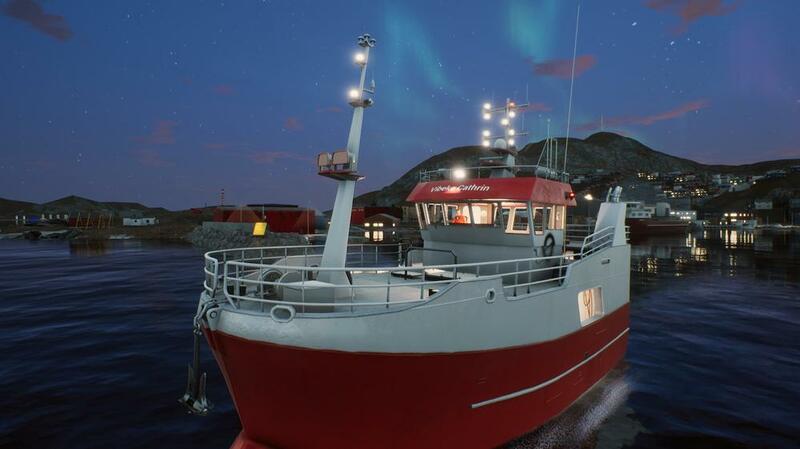 I am still learning when it comes to trawling in this game but I have a basic understanding of the workings as well as what the displays mean. There are images for the Hermes and the Lunar Bow below. 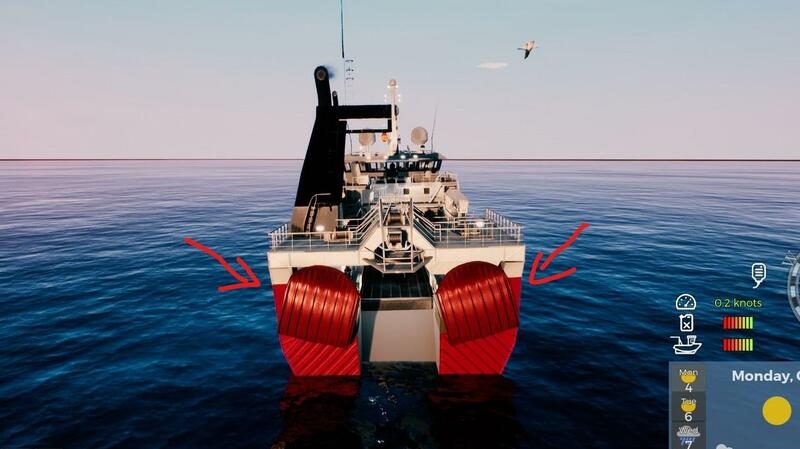 These are the trawl doors, they are connected to the warp lines. The trawling doors are designed to let water flow around them, the doors spread the net open in the water. These are the warp line levers, they control the length of the warp lines. When they are pushed away from you they are letting the lines out which increase the length. When they are pulled towards you they are bringing the warp lines in which decreases the length. The length can be seen on the Scanmare System Sensor named Length (LEN), Door. This is the switch to either start trawling by releasing the doors or to bring in the doors and then the net. The doors must be 20m out before you can use the warp line levers.In order to bring the net in the trawl door length must be below 25m. Again, you can see the length on the Scanmare System Sensor named Length (LEN),Door. 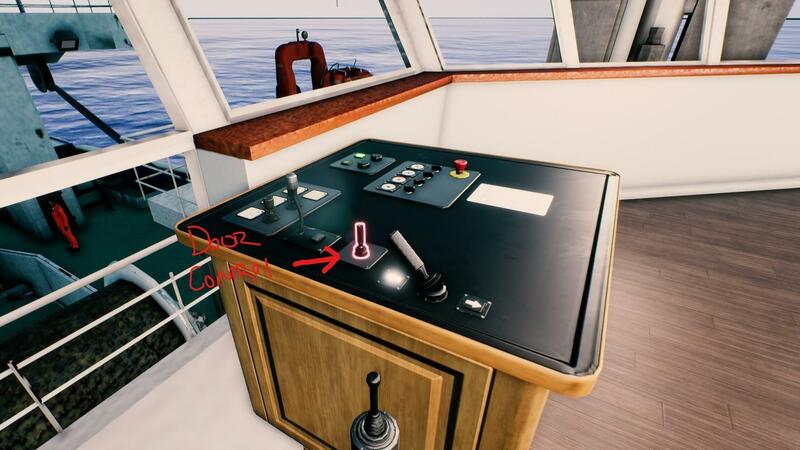 This is the lever to control the movement of the trawl doors by a small amount. You need to unlock the Scanmare DoorSensor & Control upgrade from port to use this. To start trawling you need to have four people set in the "set trawl" positions like this. To bring in the trawling net you need to have four people set in the "Haul Trawl" position like this. 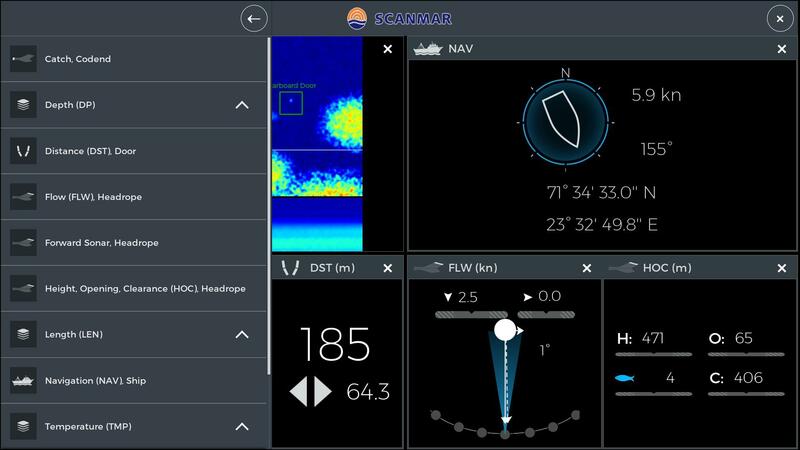 This is an overview of some of the Scanmare sytems sensors that are important. 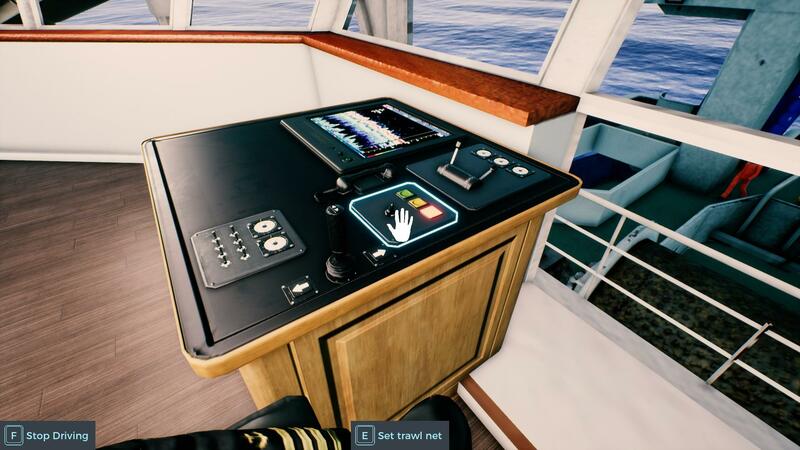 This is the Scanmare System which comes up when you interact with the screen in front of the control deck seat at the back of the wheelhouse. The list in this picture can be accessed when you click on the + symbol on the top left of the screen. The sensors in that list have the name then the abreviation in parentheses then after the comma is what that sensor is for. Ex. Flow(FLW),Headrope- shows the flow of water in to the headrope. 1. In the top left of this picture is the forward sonar, headrope screen. 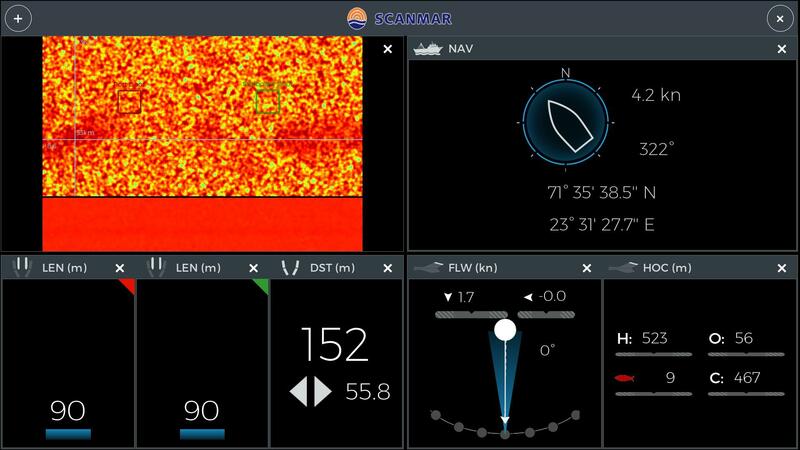 This screen shows a sonar image from the net looking towards your vessel. 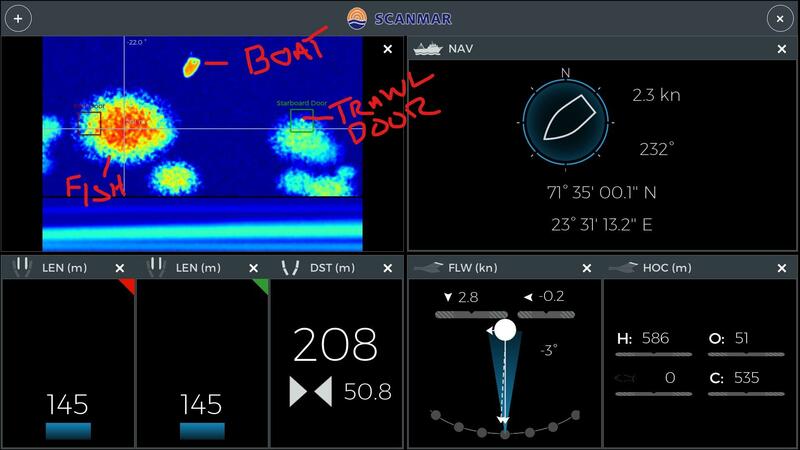 You can see the port(left) and starboard(right) trawl doors along with a sonar image of your boat and schools of fish that are coming towards your boat and therfore towards the net. The schools of fish are marked on the screen with a horizontal and vertical line. The lines show the degrees the fish are from your vessel. Where the lines intersect there is a number, this is how many meters the fish are from your net, This number will decrease as the school of fish gets closer. Some have had issues with trying to get the schools of fish into position on the Forward Sonar, Headrope screen. 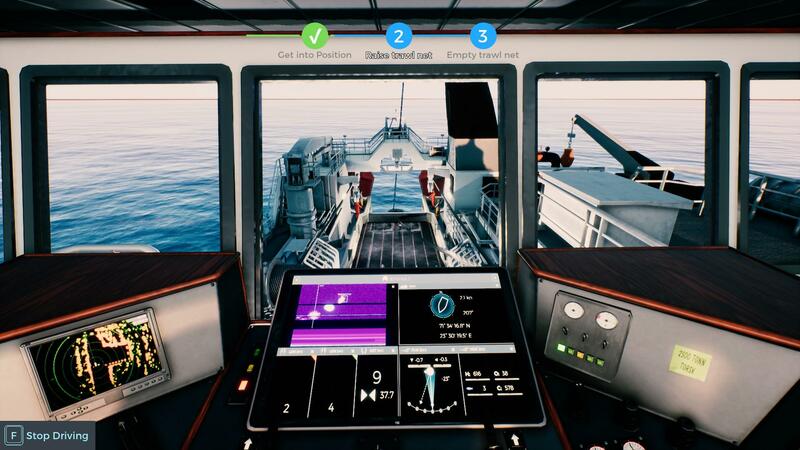 First make sure that you are not zoomed in on the Scanmare screen when trying to move the vessel to get the schools of fish in the right position. 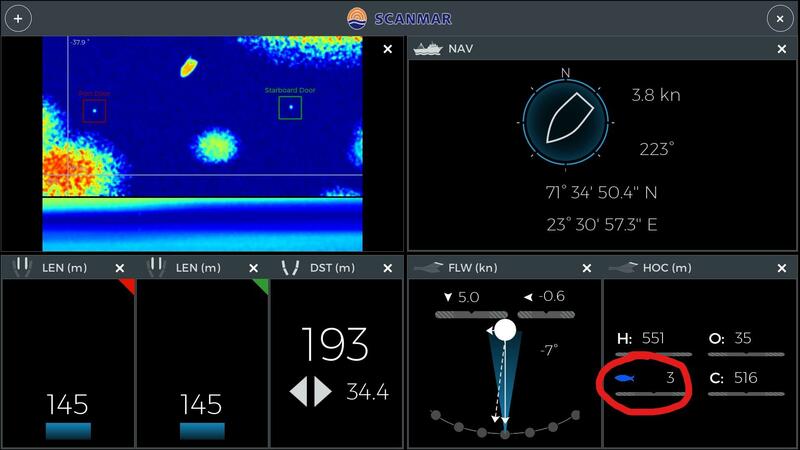 Next you need to remember that the sonars view is from the net not the boat, so when you move left or right it will take a little bit for the schools of fish to move in the right position on the sonar screen as it takes a lot to get the net to move. 2. 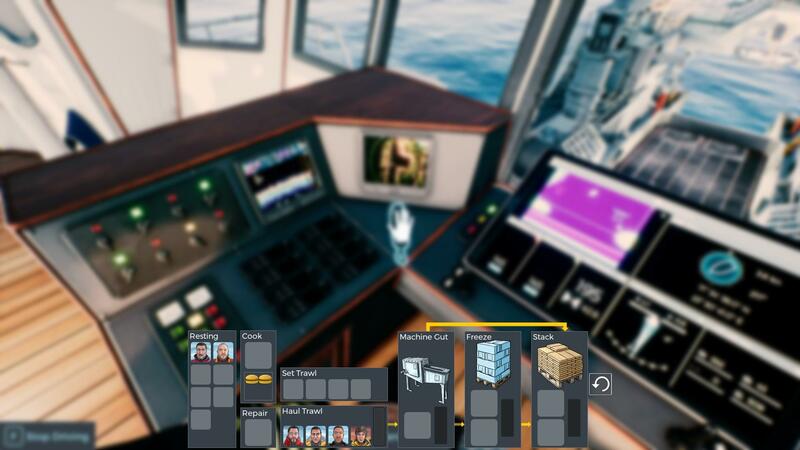 In the top right of the screen is the Navigation (NAV), Ship screen. 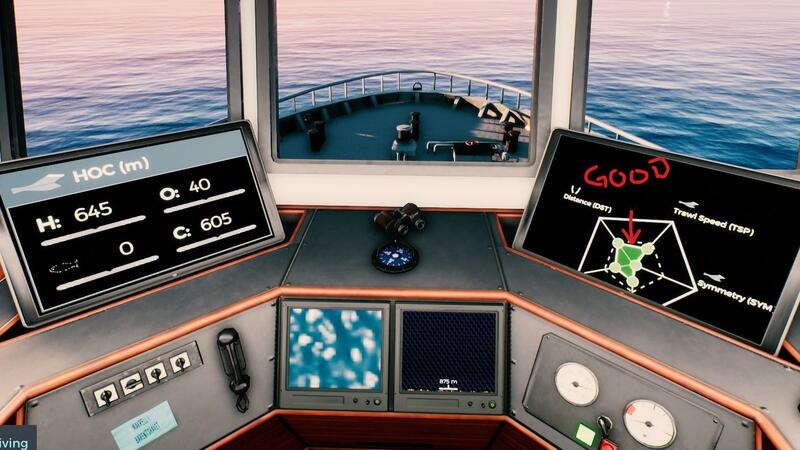 This screen shows you your heading, your location and your speed which is important as you dont want to go too fast (around 3 knots is good). 3. On the bottom left is the Length (LEN), Door screen. Which shows you the length in meters that the trawl door is from the stern of your ship. 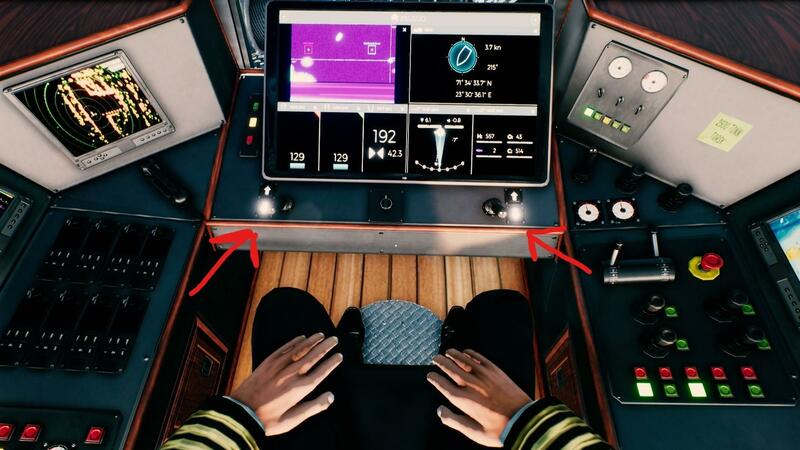 There is one screen for the port and one for starboard, the port screen has a red mark on the top right and the starboard has a green mark. The trawl door length can be controlled directly by using the warp line levers. 4. The screen on the bottom in the middle is the Distance (DST), Door screen. 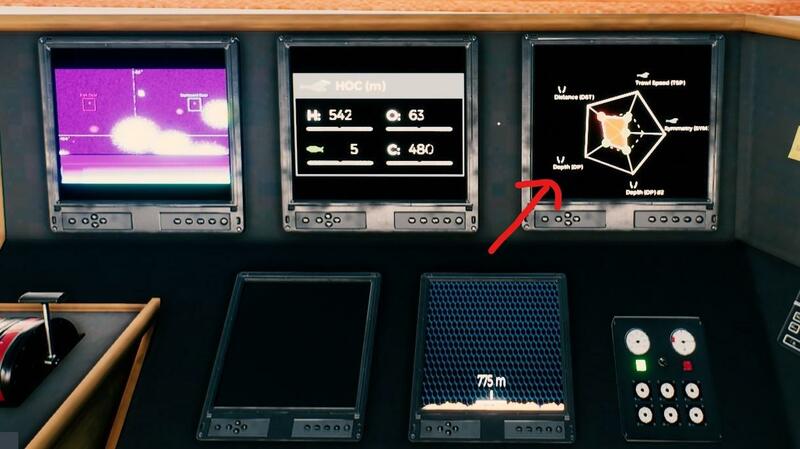 This screen shows you the distance the trawl doors are from one another in meters. There are a few ways to increase and decrease the distance between the trawl doors. First, when you go faster the distance will decrease and when you go slower the distance will increase. Last is with the Scanmare DoorSensor & Control knob which will only very slightly influence the distance. 5. The screen second to the right on the bottom is the Flow (FLW), Headrope screen. This screen shows you the speed of the water going into the headrope in knots. 6. The last screen is one of the most important. This screen is on the bottom right and it is called the Height, Opening, Clearance (HOC), Headrope screen. 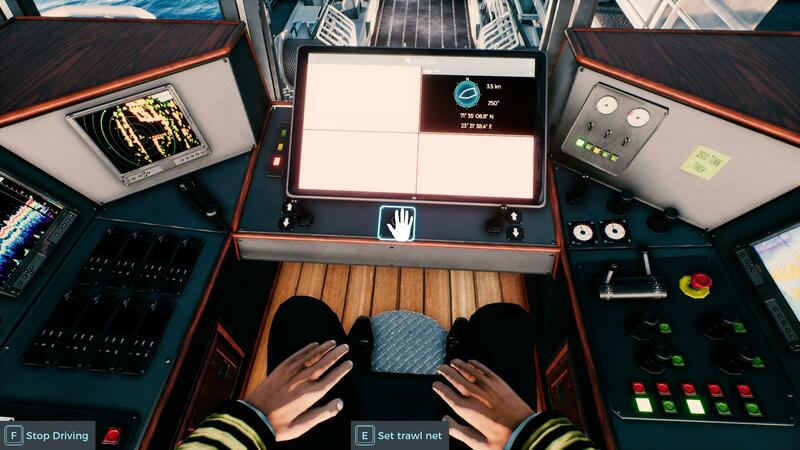 This screen is an upgrage that you must purchase from port called the Scanmare Trawleye. On this screen you will see an H, O, C and a fish symbol. These show you the Height of the trawl bag opening, the clearance to the ground and the most important is the rate of fish mass entering the net. Next to the fish symbol you will see a number from 0 to 9, 0 is no fish and 9 is lots of fish entering the trawl net. With the patch v1.0.2h the sensor called Catch,Codend should now be working. 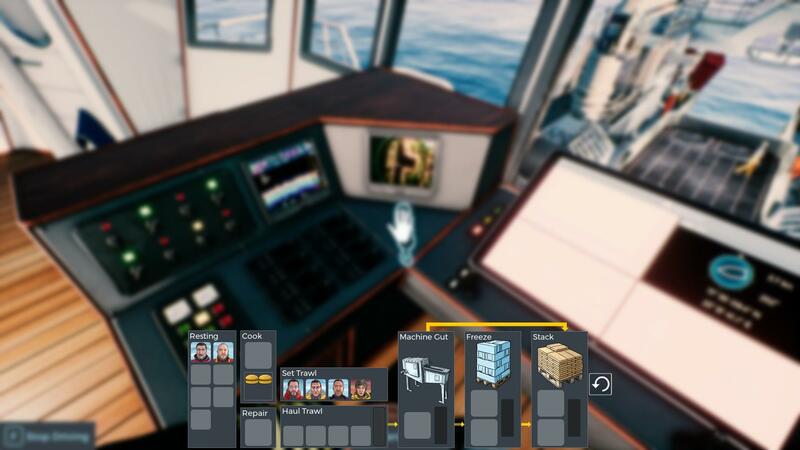 This screen will give you information on how full your trawl net is. 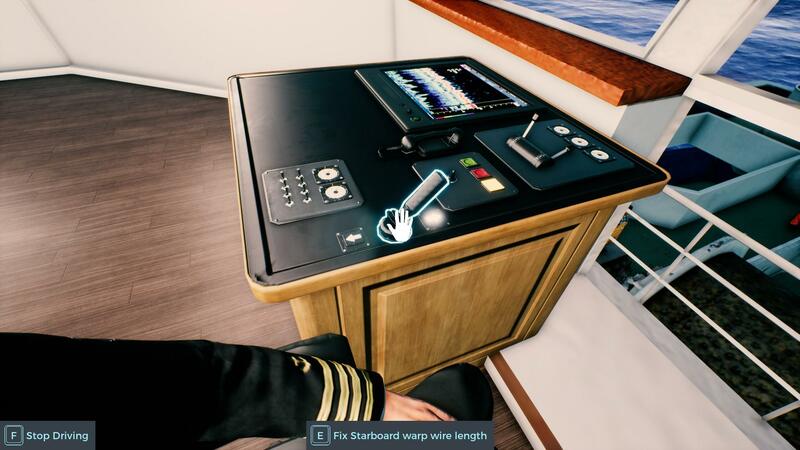 There is another screen you will want up but you can only get this screen on the displays in front of the captains chair. 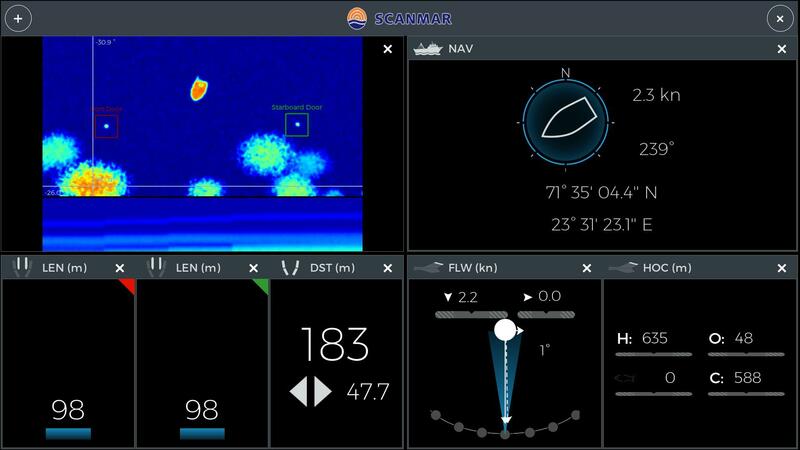 The screen you want up is the one that shows a pentagon and has the sensors called Trawl Speed, Symmetry, Distance and Depth on it. You want this screen up because it will show you when you're net is optimal for catching the most fish. When everything on the screen is where it should be the center will turn green, although you dont have control over most of the items except for the trawl speed. However you can control the distance by going faster or slower as well as decreasing or increasing the warp line length, this will also control the depth but both are not directly controlled by these means. The Symmetry is something I am having trouble figuring out how to control, so far the symmetry seems to be slightly controlled by the speed as well. Because you don't have direct control over the other sensors the color will usually be red, however you will still catch fish. There is another scanmare screen that you might want to have up but is not necessary. The Depth (DP), Door and the Depth (DP) #2, Door. These screens show the depth of the doors in meters. You cannot control the depth directly but you can influence them with how far you let the warp lines out as well as your speed. There are a couple other ways to tell if your trawl bag is getting full. When you start to have more drag from the net and you have to use more throttle to accelerate then your trawl bags are getting full. However it is unknown how full they are by using this method but it is still a good sign that it is ok to bring in the trawl net soon. Be aware that the wave size will also affect this, the bigger the waves the more you will have to accelerate to get any speed. You can bring up the sensor screen called Tension (TNS). This screen will show the amount of tension on the warp lines. As your bag fills up with fish the tension should rise indicating that it is ok to bring in the trawl net soon. Be aware that the tension will also increase with speed, with decreased speed the tension will subsequently decrease. With all of the other sections knowledge here is how I trawl as well as my setup. First I put my employers in the proper positions. Then I release the trawl net. Once the doors are more than 25m out I make sure I have the right screens on the Scanmare. Finally I let the doors out around 125m to 160m, I then bring my speed to around 3 knots and then just let the ship go while keeping an eye on the various screens. When fish are going into the net the sonar will look like this.The screen will be all red and yellow which shows that there is a mass of fish entering the net. This is also shown on the HOC screen, the fish symbol will be red with the number 9 next to it. Now you have a lot of fish entering the net. Also if you have the catch,codend screen up then you will begin to see the boxes fill up when you have fish entering the net. You can control the doors slightly with the Scanmare DoorSensor & Control knob. The keyboard controls for this are the arrow keys (up, down, left and right). 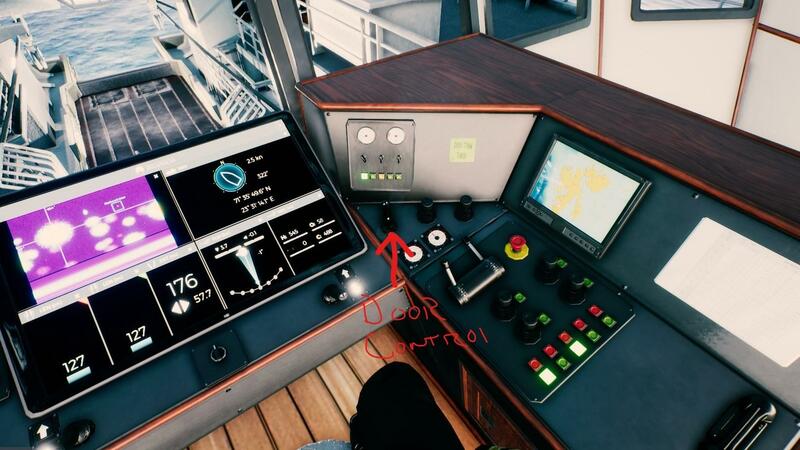 It should help with the distance of the doors, However from my experience the control is minimal to none at all, it is very difficult to control the doors at all with this. I do hope this is fixed in a later patch. You only need to trawl for a few minutes, 5 or 10 is fine, to catch enough fish. You do not need to trawl for hours, also dont let your trawl doors out all the way, as I said before, around 125m to 160m is fine. 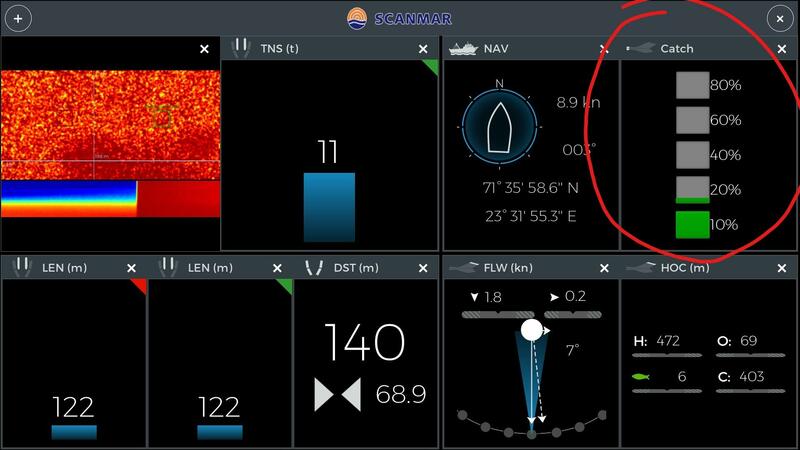 For tips on how to find out if your trawl net is full without using the Catch,Codend sensor go to the end of the Scanmare System Sensors section. Once you have been trawling for a little bit and want to finish you simply bring in the warp lines with the warp line levers towards you. Then make sure you have your employees in the right place. Once the lines length is under 25m you hit the switch to haul in the net. After this is done you will see this screen. Now just wait for the loading to finish and your done! There are videos out there that talk about trawling but not many that explain it well.